Obsessed with your whip? 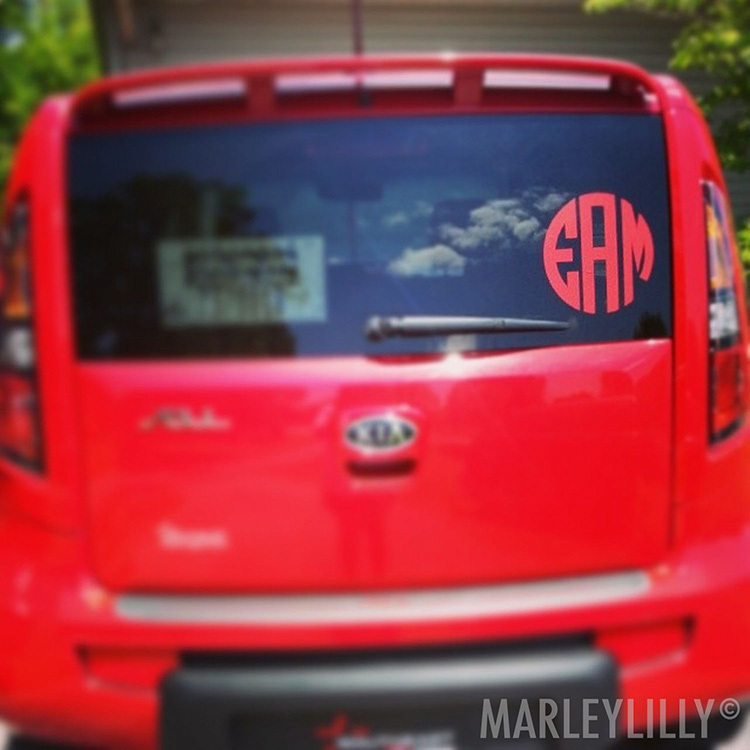 Make it all your own with some amazing monogrammed car accessories. These motor-worthy monograms are ideal for showing off your preppy or Southern sense of style wherever you go, whether you’re parked at your apartment complex or midway through a massive roadtrip. We’ve got cute car accessories for all sorts of personalities and styles, including custom decals for your window, unique keychains so you never lose your keys and stuff that gets you organized, all of which bring a practical and personalized feel to your ride. Here are some of our faves. 1. Monogrammed License Plate—Turn heads on the highway with a personalized license plate that features your monogram over some fresh and fun patterns. These sturdy aluminum plates have permanently printed designs, so you know they’ll stay in great shape for many miles. Personalize yours with one of tons of cute prints—pineapples, seersucker, palm trees, camo, footballs —and your preferred colors and monogram style. If you live in a state that doesn’t require a front license plate, you can install this cute little extra on the front of the car so that everyone knows you’re coming! 2. 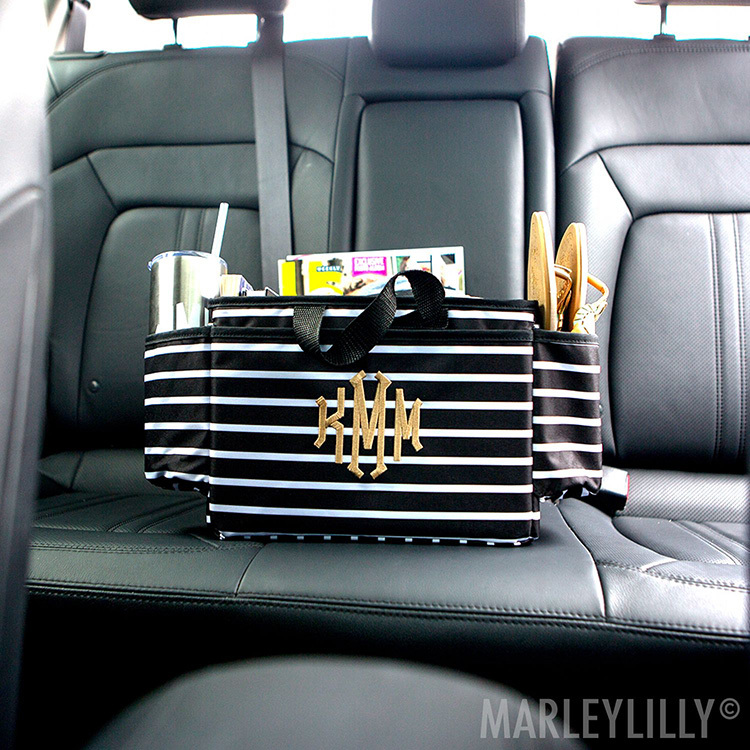 Monogrammed Car Organizer—Raise your hand if you’re guilty of a sloppy backseat? 🙋 A monogrammed car organizer helps you keep all your stuff neat and tidy so that you don’t have to scramble before you pick someone up! 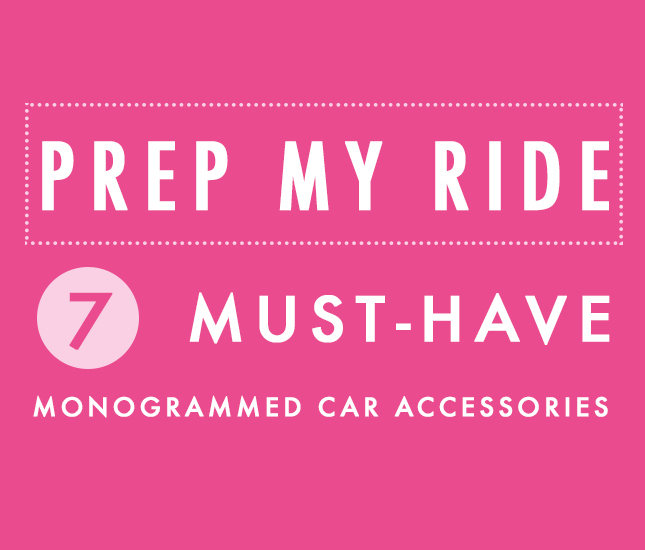 Each one has lots of compartments for all sorts of car staples, like an extra sweater, some sunglasses, maps, an umbrella and your favorite to-go coffee mug. More of a trunk slob? Our monogrammed trunk organizer will do you wonders! Both of these cute accessories come finished with your monogram for a super cute way to rep your style. These also make fantastic gifts for drivers who are a bit on the, dare we say, messy side. 3. Monogramed Car Decal—Show everyone on the road what you’re all about with a personalized window decal done up in your favorite style and color. We’ve got all sorts of wonderful window stickers ranging in size from 3 inches (good for corners and mirrors) to large and in-charge 10-inch window decals that you can use to create an eye-catching back window design. Our decals are specifically made to be applied to glass and are made of a high-quality, outdoor-friendly vinyl that resists fading, so you can expect them to jazz up your windshields for years to come. 4. Monogrammed Keychain (Or Two)—Tassels, leather, pineapples, seersucker! The Marleylilly personalized keychain department is jam-packed with truly stylish keychains that will bring some charm and personality to your ride. We have an excellent collection of cute monogrammed keychains that make awesome gifts, including leather key fobs that provide a posh and preppy feel. The best part about a monogrammed keychain is that it ensures that you never lose your keys because everyone knows which set is yours! 5. Monogrammed Umbrella—There are two necessary trunk extras that just don’t get enough love: the car umbrella and the car blanket. The former is ideal for when you’re running around town on those unpredictable fall and spring days, and what better way to be prepared than with a monogrammed one in a super cute design? Pick one that folds down to be compact enough to toss in your purse so you can take it with you if it looks like it might rain. 6. Monogrammed Blanket—The car blanket is the unsung hero of your car, especially for passengers who might catch a bit of a breeze in the backseat. When picking out a car blanket, you shouldn’t invest too much and you should pick a style that you can toss in the wash, because things can get dirty on the road. Our monogrammed sweatshirt blankets fit the bill and bring some personalized charm to your backseat. It’s also soft and comfy, so your guests will feel like absolute royalty! 7. Monogrammed Gloves—There’s nothing worse than driving with cold hands! Make sure that you’ve always got a good (warm) grip on the steering wheel with our trendy, personalized gloves. Ours come in a great assortment of preppy and classic styles, including charcoal, black herringbone and camel plaid, so you’ll want to sport them when you get to your destination, too. Pimping your ride is all about finding practical accessories that also celebrate your unique and bold sense of style. We’ve got all the most clutch car accoutrements so that you feel like you’re hitting the road ready for anything!